With Microsoft code signing from Thawte, you can assure users that your code and content is safe to download, and protect your most valuable business asset: your reputation. Microsoft Code signing authenticates the code's source and confirms the integrity of content distributed online. Thawte Code Signing Certificate for Microsoft Authenticode (Multi-Purpose) offers maximum flexibility with a single certificate to sign code developed on multiple platforms. Inspire user confidence by showing customers your verified identity and the integrity of your code. Protect brand assets and reputation by preventing your code from being damaged or falsified and making it easy to recall. Buy, renew, and manage code signing certificates with a single, secure sign-in to Thawte Certificate Center. Save time and money by purchasing multi-year Code Signing Certificates. Thawte Code Signing Certificates create a unique digital signature with identification information about the publisher of the code and proof of the code's integrity. Microsoft applications such as Internet Explorer, Exchange, Outlook and Outlook Express have security features to check for a digital signature and recommend whether or not code should be trusted. When a user encounters unsigned executables, a security warning pops up or content fails to load, depending on the user's security settings. 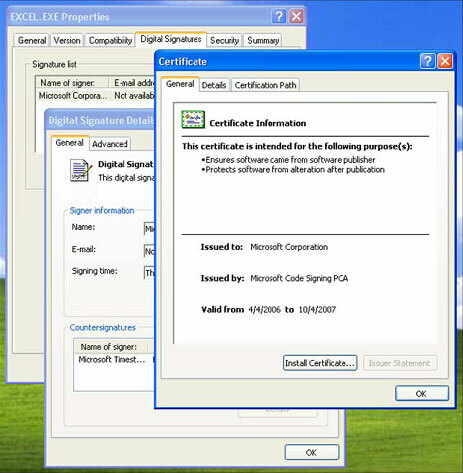 When a signed executable is encountered, a pop-up notification shows the verified identity of the publisher and the user decides whether or not to trust the code. By clicking "More Info", the user can inspect the certificate. Select certificate options and a validity period. Enter certificate information (choose the default if you are not sure), create a backup and follow instructions. Enter organization and billing information. Create a Thawte Certificate Center account or sign in to an existing account. Pick up your certificate in Thawte Certificate Center after Thawte completes authentication. NOTE: You must buy and retrieve your Thawte Code Signing Certificate from the same computer. Problems? Confirm that you are using the same computer, browser, and log-in profile used to enroll. Your Thawte Code Signing Certificate contains your full organizational name and your public key. It can be used to digitally sign code and content during the certificate validity period.